Late summer in the Midwest means crabgrass. Some summers are worse than others for this hot-weather nuisance grass. And this summer has proven to be a good one for crabgrass, meaning a bad one for lawns. Fortunately, an organic approach to control crabgrass can work over time to reduce its presence. Control crabgrass organically and sustainably without using toxic, ineffective herbicides. In order to control crabgrass, it’s important to understand what’s going on in your lawn this time of year as well as how crabgrass grows. Summer brings quite a bit of stress to lawn grasses. Heat and drought, such as the conditions we’re currently experiencing, damage the lawn. Add to that the fact that we aren’t as forgiving of the lawn’s appearance in the summer as we are in the winter. 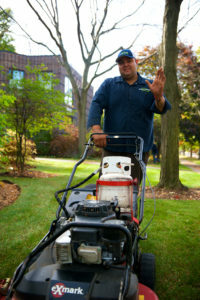 We want our lawns lush and green in the summertime for outdoor activities. We try to fight nature by continuing to fertilize, water, and coax new growth out of our lawns no matter what the weather. Cool-season grasses, such as the fescue, bluegrass, and rye found in Midwest lawns, grow best when temperatures are in the 60-degree range. Once temperatures get into the 80s and above, lawns will begin to struggle a little. Growth slows, color fades, and lawns will show signs of wear and tear as they are less able to recover from stress and traffic. Some cool-season lawns will even go dormant in the summer, looking brown and brittle until early fall when they bounce back. Be sure to put down desirable grass seed on bare patches as you see them. 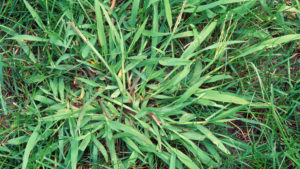 Crabgrass is an annual weed. It grows from seed each year. Crabgrass loves hot, dry weather and thrives in temperatures of 80 degrees and hotter. Furthermore, crabgrass picks up steam just as lawn grasses are slowing down. Crabgrass will take advantages of bare patches in the turf. It loves hot areas by paved driveways and walkways. Luckily, you don’t have to resort to using harmful, toxic herbicides to control crabgrass. These unsafe chemicals may kill the crabgrass on the spot, but don’t actually control crabgrass in the future. Since crabgrass seed needs light to germinate, mow 3″ or higher, and be careful not to scalp your lawn. 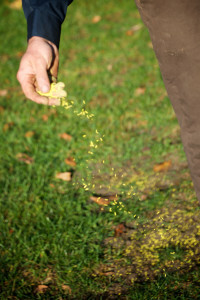 Pull it: Pull out the crabgrass by hand or spot treat with an organic herbicide. And cover bare areas immediately with sod or seed. Mow high: Mow no lower than 3″ from spring on. Crabgrass seed needs light to germinate. Taller grass shades the soil and keeps it cool, minimizing germination of weed seeds. Crabgrass takes off when people mow too low or scalp a patch in summer. When you open up the light canopy in the lawn, more crabgrass seeds germinate. Seed: Put down desirable grass seed on any bare patches as you see them. And we recommend overseeding your entire turf in fall. Prevent: Fertilize with corn gluten meal in the spring. Studies show that corn gluten has some pre-emergent benefits. That means it prevents seeds from germinating, so applying it at the right time of year will control crabgrass and other undesirable turf plants. Bag it: At Greenwise, we don’t usually like to remove clippings from the lawn. But if you have a lot of crabgrass, bag your clippings when you mow the crabgrass this time of year. Get rid of the crabgrass seeds and you will prevent them from germinating in your lawn. 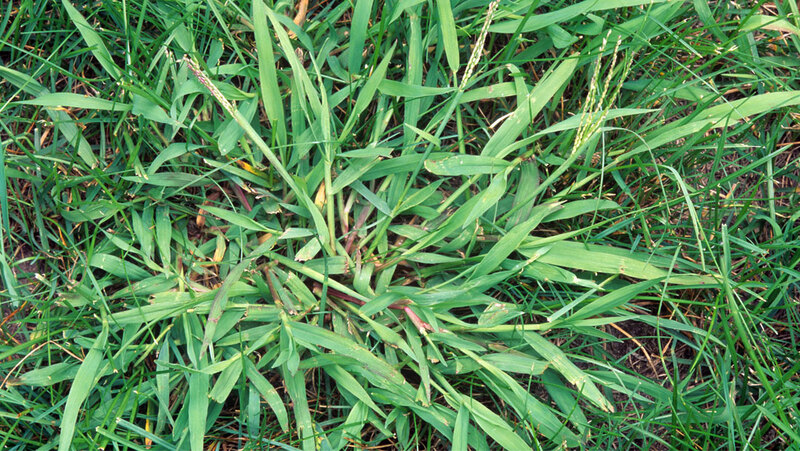 Keep calm: Don’t get too wrung out about killing crabgrass in August. It’s going to be dead at the first frost, anyhow. It’s an annual grass. Finally, for more information on how to control crabgrass safely and sustainably, please read about Greenwise’s Organic Lawn Care Program. What about crabgrass that inundates flowerbeds? That’s my main problem and, due to chemical sensitivities, I can’t use herbicides (plus, I don’t want to due to their environmental impact). I’m too handicapped to pull or dig it out. Thank you for your question, it’s actually something we get asked a lot so it’ll be helpful for other to have our recommendations as well. We don’t use or approve of toxic, chemical herbicides either. There are organic, natural non-selective options that will kill weeds. Because they are non-selective, they will kill any vegetation they contact, so care must be taken in using them. These include things you may already have on-hand, such as highly concentrated vinegar or boiling water, both of which act as natural herbicides. Commercial products such as Finalsan® Herbicidal Soap and Mirimichi Green Weed & Grass Control are also safe, non-toxic herbicides and can be found online or at local hardware or home-improvement stores. Depending on how much crabgrass is growing in your garden beds, we recommend first hiring a lawn care company such as Greenwise to do a one-time clean-up to get rid of it all and make the job more manageable. Then keep the crabgrass under control using an organic herbicide as necessary. While we always recommend using professionally trained lawn care companies to work in your garden beds, we understand that they may not always be in your budget. Since crabgrass is pretty obvious when growing in the garden beds, you could hire a neighborhood kid to hand-weed it regularly to keep it maintained without worrying about them pulling out the flowers! 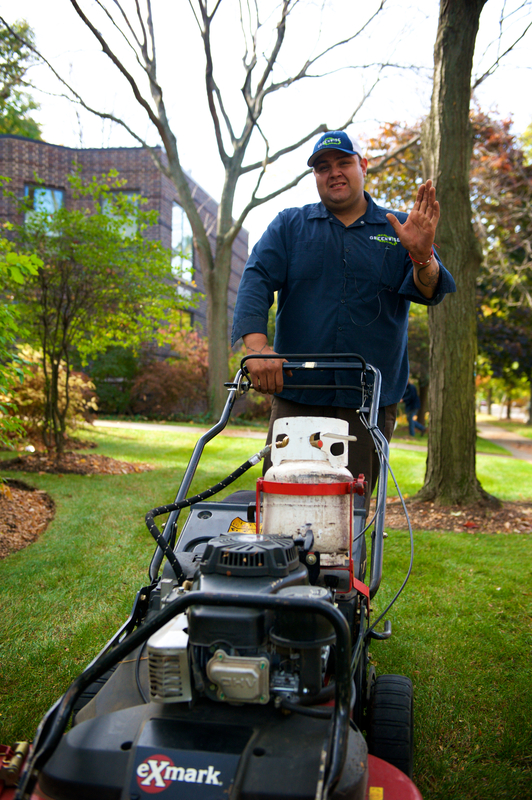 Thanks again for your great question, and best of luck with the crabgrass! baking soda spread on lightly. wet hands and put the baking soda on your hands and gently rub the crabgrass. t will turn black and die. Baking soda is an excellent suggestion: Effective and safe! We’d love to hear from others as to what natural remedies you use to safely get rid of weeds without resorting to harmful, toxic synthetic herbicides. I personally love the look and feel of a lawn mown high–so lush and bouncy under bare feet! Crabgrass prevention is a pleasant side effect. 🙂 The folks who mow short to avoid having to do it so often might want to consider a no-mow lawn comprised of native plants–grass isn’t the only option! But for those who do want a more traditional lawn, does Greenwise know of/work with grasses that are more heat tolerant and better suited to our climate? Or would those varieties not overwinter as well? We love natives, too, and encourage our clients to use them. They are not only beautiful and generally easier to care-for, they “lighten your footprint” by requiring less fertilization and water use because they are better-suited to grow here. No-mow lawns have an even greater positive impact on the environment for those homeowners who don’t need or don’t use their grass lawns. For traditional lawns, we use a tall-fescue blend of grasses (including bluegrass and rye) that is best-suited for the Midwest climate. A blend of grasses will flourish under the extreme temperature range those of us who live in Chicago know and love– super-hot summers and polar-vortex winters! Crabgrass flourishes during the relatively short and infrequent period of summer with extremely high temperatures combined with insignificant rainfall, like we’re experiencing this August. Normally, the tall-fescue turfs outcompete the crabgrass. Last summer, for instance, was had a more “normal” weather pattern and we saw very little crabgrass in our clients’ lawns. Pulling out the crabgrass and replacing it with a tall-fescue grass seed mix will generally keep it under control. Remember, there is no botanical definition of a “weed”– it’s just a plant growing where you don’t want it to grow. So replace it with a plant you DO want there!